Comet Halley doesn’t visit often ( 1910, 1986, again in 2061 ). Not to be forgotten, every October delivers the Orionid meteor shower – an annual event marked by Earth intersecting the orbit of Halley’s dust trail. Dust being tiny particles of ice and debris left in the wake as Halley hurtles through space. Dubbed “Orionids” because “shooting stars” streak from constellation Orion. This year the Orionids peak on October 20-21 in the northern hemisphere. 2014 is a good year for Orionid views – a cooperative waning crescent moon will rise just before dawn. Provided skies are clear, moonlight won’t compete with falling star twinkles. 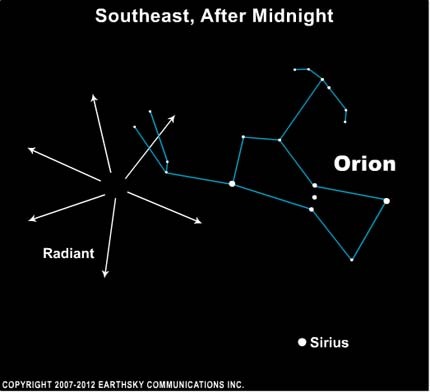 Orionids reliably deliver around 25 sightings an hour. Indulge just before dawn, far away from cities and light pollution. The Orionids radiate from a point near the upraised Club of the constellation Orion the Hunter. The bright star near the radiant point is Betelgeuse.